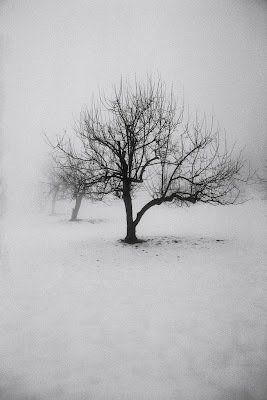 writing to reach you*: grace grows best in winter. grace grows best in winter. when the tree looks dead. when all the leaves have fallen. when no life appears to be bursting forth. then the roots grow deep. how am i going to use these long dreary months of winter? will i continue on in my old habits of staying couped up inside all day long. of making excuses for my bad moods. of dreading each day because it means facing the bitter cold? or will i decide that in these months - when the pace of life slows down a little bit. that i will pay attention to my growing roots instead of the bare branches surrounding me? i have been preparing for this day of first snowfall for months now. reading, writing and praying that my God will allow me to see more this time. to look beyond my immediate wants and desires into the abundant gift of grace that is present in the midst of the season. i know that with this new mindset things won't automatically be easy, but i know that my awareness and my desire to seek harder after God's blessings and hopes for my winter will allow me to not simply endure, but to find life.